Since Windows 7 has been officially released and some of the built-in application already support the multi-touch features, it is a waste if you do not test it out. But how? If you have an extra mouse, then you are good to go. 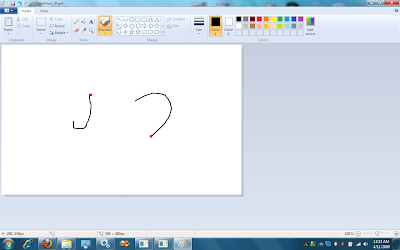 The idea is to simulate multiple touch points with multiple mice using Multi-Touch Vista. 1. First go to Multi-Touch Vista Download Section and download the Recommended Download. The current file as of 3/11/2009 is "MultiTouchVista - second release - refresh 2.zip". 2. Extract the zip file to a folder easily accessible. 3. Go into the "Driver" folder and then select "x32" if you are using 32 bit Windows like me (don't go into it, just select it). 5. In the command prompt, press "tab" a few times until you see "Install driver.cmd" and press "Enter". Answer "Yes" for User Account Control. 6. Now you can close the command window and go to "Control Panel" and then "Device Manager". 7. Expand the Human Interface Devices. Right click on "Universal Software HID device" and select "Disable", answer "Yes" for the prompt. Then "Enable" it again. This actually did a reload and the driver should already start working. 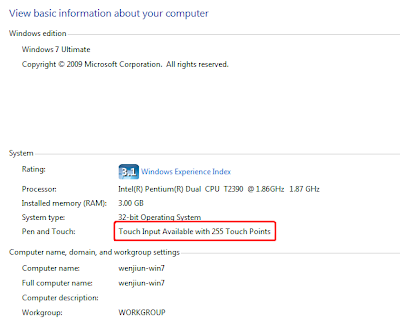 To confirm that, go to "Control Panel" and then "System" to check that "Pen and Touch:" is "Touch Input Available with 255 Touch Points". 8a. To run Multi-touch application created with Multi-Touch Vista Framework, go to the Multi-Touch Vista folder extrated earlier, find "Multitouch.Service.Console.exe" and double click to run it. The default input is already set to MultipleMice, so you can see red dot moving together with the mouse but it will not be at the same location at the mouse cursor. You still have to use the regular mouse cursor to interact with the windows as the red dot will only interact with applications created using Multi-Touch Vista Framework. You can try creating a "Hello World!" by refering to this tutorial. Whenever you are adding mouse or removing mouse, you have to restart "Multitouch.Service.Console.exe". 8b. To test Multi-touch features in Windows 7, first go to the Multi-Touch Vista folder extrated earlier, find "Multitouch.Service.Console.exe" and double click to run it. You should see red dot corresponding to the mouse cursor (probably not at the same location). Now go to the same folder (use the regular mouse cursor, the red dot doesn't interact with Windows yet) and find "Multitouch.Driver.Console.exe", double click and run it. Now Multitouch driver should be running, but the original mouse cursor still dominating. Now go to the same folder and find "Multitouch.Configuration.WPF.exe", double click and run it. Click on "Configure device", tick on the empty box for "Block native windows mouse input....". and press "Ok". Now the red dot can finally interact with the Windows. Some of the things to try you can refer to the paragraph after 8c. To stop it (sometimes mouse interaction totally gone after testing for a long time), use "alt-tab" to reach the two command windows and press "Enter" to end them. 3. Activate the software keyboard on the left edge of the Windows and type using it. The above steps to install the driver is actually extracted from the following video but I have to do some minor modification due to newer version.